A Gauge R & R (Gauge Repeatability and Reproducibility) Study carryout to ensure dimensional control for new and existing gauges. Who will conduct this study? The Quality Engineer shall be responsible for implementing this procedure. How to proceed this study in organization? 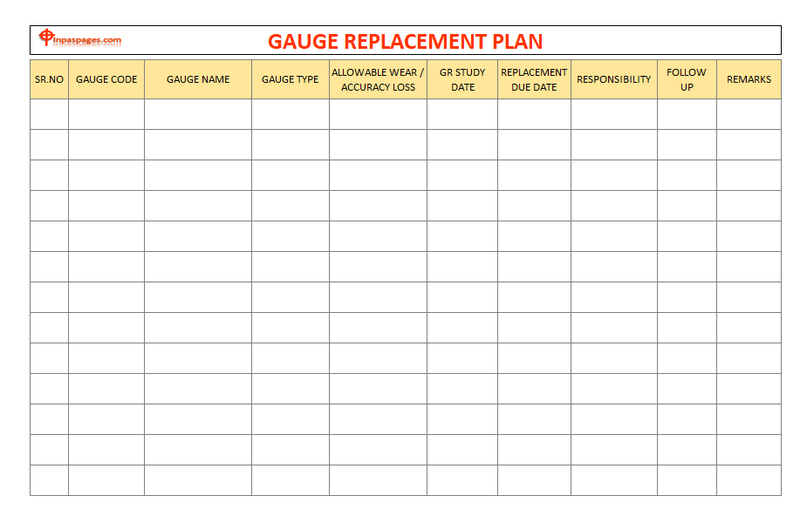 The Quality Engineer shall maintain a master list and status of all gauges that are under usage. The GRR (Gauge Repeatability and Reproducibility) studies for all the variable gauges shall be carried out at regular intervals, at least once in three months as per the GRR study plan. All new variable gauges shall undergo GRR studies prior to release for use. The GRR studies shall be done with reference to +/- 3 sigma limits and the tightest tolerance to be measured using the particular gauge. Second set of measurements with the same parts and the same inspectors shall be taken in the reverse order of parts i.e. from 10 to 1. From the above readings the calculations shall be done as detailed in the GRR study report. 3.7 If the Percent Tolerance Consumed (PTC) is less than 10 % then the gauge is acceptable. If PTC is greater than 30 % then the gauge is not acceptable. If PTC is between 10 – 30 % then decision shall be made depending on the criticality and documentary reasons for accepting the gauge shall be maintained. The Gauge Evaluation is carryout periodic gauge evaluations on current measurement systems and to improve and acquire refined systems. The data pertaining to the performance of gauges through calibration history, maintenance and GRR reports shall be gathered. He shall then carryout Wear pattern analysis of Attribute gauges and Accuracy loss analysis of Variable gauges through correlation studies (by using method of least squares for line fitting). The status of existing gauges shall be review through status of inspection, measuring and test equipment. 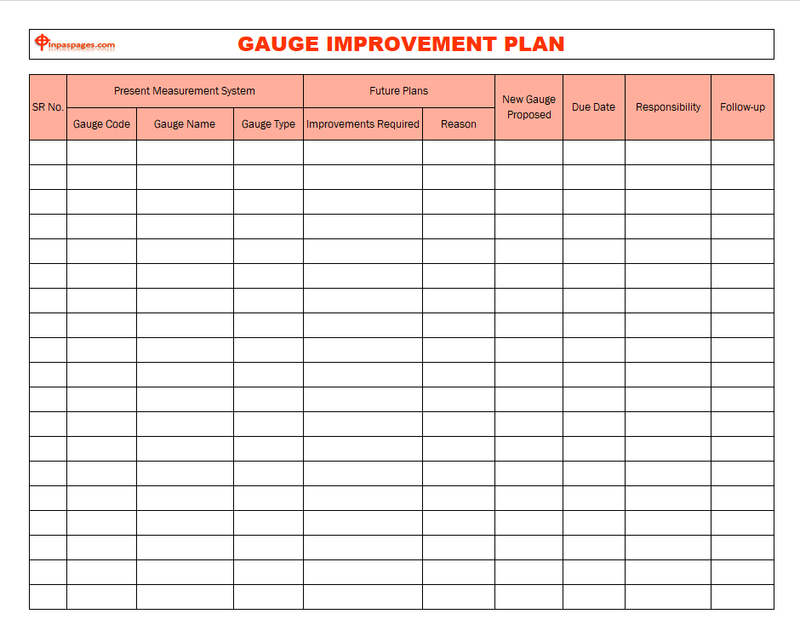 Base on the above analysis the Quality Engineer shall prepare and document the replacement plan for the gauges which shall clearly project the time period by when the gauges are to be replaced. He shall also identify the resources and responsibilities for carrying out the task. The replacement plan shall cover at least one forward year. The Quality Engineer shall gather data on the existing measurement techniques and gauges. Future plans of the customer expectations etc. He shall then prepare and document the Gauge Improvement Plan to suit the future needs and requirements. The plan shall also include the necessary changes for moving from current level of attribute gauging to variable gauging. The plan shall clearly identify the resources and the responsibilities for carrying out the task as per schedule. The Plan shall cover at least two forward years, and shall be review once in six months for additional requirements, changes etc. Select one member from each family of instrument for the study. Verify that the selected member is currently use in shop floor for routine inspection. Ensure that the selected instrument is calibrated within acceptable error limits (Bias & Linearity should be OK). Select the characteristic/dimension (preferably critical) to be measured by the instrument / gauge (refer control plans). Record the preparation in a sheet of paper. Refer to tolerance or process variation (if SPC study is done) as applicable. Choose parts randomly from production in such a way that the selected parts must represent the entire operating range (tolerance or process variation). Measure the selected parts with a master instrument and record the measurements in a sheet of paper. While doing the measurement, ensure that within part variation is negligible by measuring the dimension at several places (if applicable). Number the parts 1 through 10. Ensure that the number are not visible to the appraisers while conducting the study. Select appraisers for the study amongst those who normally perform the measurement of the selected characteristic either during operation (or) during in-process inspection. The number of appraisers could be 2 or 3 based or critical of dimension & availability. Designate them as appraisers A, B&C (if applicable). While selecting the appraisers give consideration to skill & experience so that selected appraisers represent the entire range of manpower doing the measurement. Make a list of appraisers & their basis of selection. Use the GRR study report format. Let appraiser A measure 10 parts in a random order. 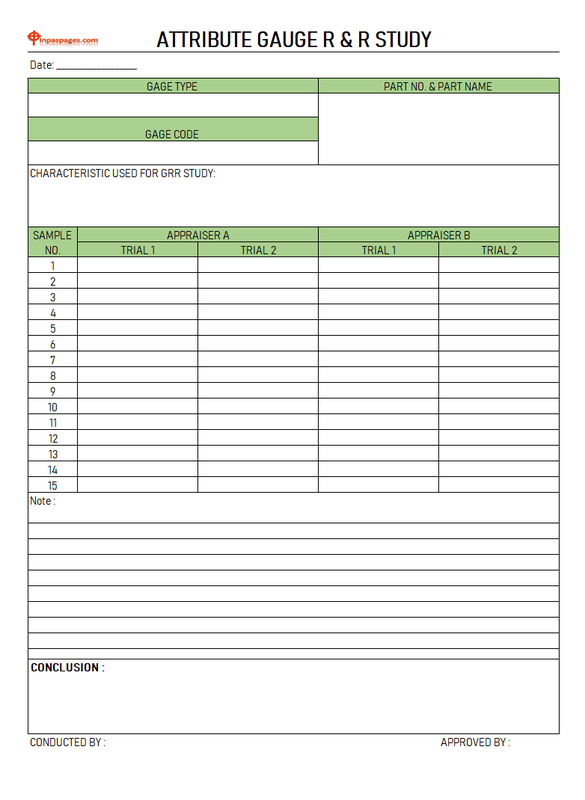 Record his observations in appraiser A trial 1 column. Let appraisers B& C measure the same 10 parts in a random manner without seeing each other’s readings. Enter the results under Trial 1 columns of Appraisers ‘B’ & ‘C’. Repeat the above cycle using a different random order of measurement & enter the results in trial 2 columns for each appraiser. Calculate the following as per formula given in the format. R bar, Xbar A, X bar B, X bar C.
EV, AV, R&R, PV & T.V. Calculate % EV, % AV, % R&R, & % PV with respect to TV. If % R&R is < 10% – Instrument is acceptable.10 to 30% – Calculate % R&R with respect to Tolerance & check whether it is less than 10%. If yes, accept the gauge by giving suitable remarks > 30% – Instrument is unacceptable & report to plant manager for taking further action. Plot repeatability (Appraiser wise) range control chart & verify whether all points are within UCL R & LCL R. If not, investigate the cause & re-conduct study. Plot Part appraiser average chart (Appraiser wise part averages are to be plot). Calculate UCL X bar, LCL X bar & X double bar as follows. If majority of points fall outside the control limits, the instrument is consider to be having discrimination to detect process variation. Otherwise investigate & decide upon further use of instrument. If it equals or more than 5, the instrument is acceptable for control & analysis. Otherwise take decision regarding further use of the instrument. Conclude the GRR study based on the results by giving appropriate remarks. Same as Variable gauge study appraiser selection. Repeat the same for appraisers’ B & C.
Conduct Trial 2 as above. The gauge/ measurement system is acceptable if all the decisions (6 per part) agree. If they do not agree the system/gauge must be improved & re-evaluated otherwise an acceptable alternative measurement system to be employed.